Force, simply defined, is the energy required to accomplish a task. Exertion, on the other hand, is the effort the individual needs to expend to accomplish the task. Although the force needed for a task may remain constant, exertion can vary based upon several factors such as posture (positioning of the body while performing a task), repetition (the number of sequential times the task needs to be performed) , and the environment in which a task is performed (such as in a hood or other protected area). For example, the amount of force or energy needed to move a five pound object a distance of one foot is well defined. Now consider moving that same five pound weight the same distance repetitively 50 times. The amount of exertion or effort needed to complete the task on the 50th time will be far greater than the effort needed to complete the task the first time. 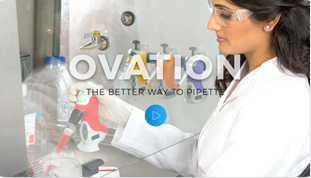 Although there may be little that can be done to reduce the repetitive nature of pipetting, there are several things that can be done to reduce the exertion or effort required to complete the task, as well as minimize the negative effects of over exertion. The first and most important step is to maintain proper posture while pipetting (see section on Posture). This will help to maximize your available strength, reduce tension and stress and limit muscular fatigue. Avoid awkward static positions. Static work produces fatigue quickly. Blood brings oxygen to the muscle groups to allow them to function properly. During periods of rest, the demand for oxygen is low. In dynamic work, such as exercising, the demand for oxygen increases. Through an increased heart rate, blood flow is increased and therefore the supply of oxygen. 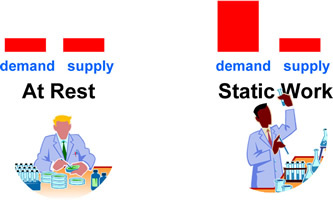 However, in static work such as holding the arm in an elevated position while pipetting, oxygen demand is increased due to the static load placed on the shoulder muscles but blood flow is not increased and there my be constriction of vessels at pressure points. Such static work produces fatigue quickly, causing tension, soreness and pain. Avoid arm, wrist and hand positions that can reduce strength. Correct posture allows the muscle groups to function freely without restriction (neutral positions). Deviation from these neutral positions places stress on the muscle groups, reducing available strength. This means more exertion will be required to complete the same task than if the arm, wrist and hand were in a more correct posture. 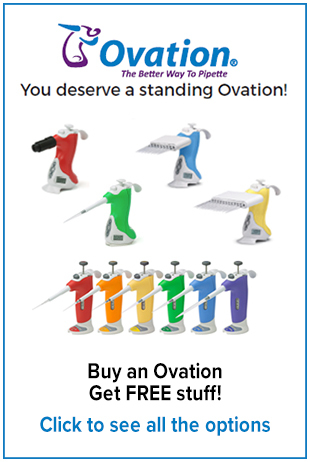 Although it may be impossible to avoid certain arm, wrist and hand movements due to the nature of the work, using a pipette that minimizes rotation and deviation and thereby reduces stress on the muscle group is recommended. 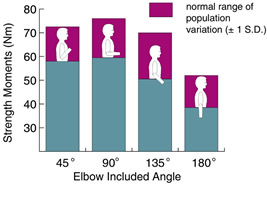 Avoid elevated arm positions. Keep work items within easy reach to limit extension and elevation of arm. 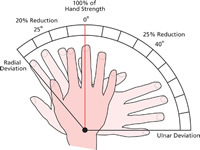 Arm/hand elevation should also not exceed 12” from the worksurface. 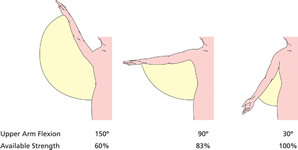 Keep elbow posture near a 90° position. Corrective action: Available strength diminishes when the elbow is raised or lowered. Keep work items within easy reach and limit work where arms are in an elevated position (see section on Best Practices for Workstation Organization).